-> When we harm or take advantage from someone, we create a debt to them. Even though we pay back and hope to “get even” later, the fact of hurting remains. -> Even if someone own and hurt ourselves, we can stop the hatred by forgiving. -> When one forgives, there is no need to getting back, and therefore the wheel of hatred stops. -> Kindness attracts kindness, hatred attracts hatred. That’s how the universe works. Universal justice is impartial. “怨怨相报何时了？Is there an end if we keep going after each other’s wrongdoings?” An eye for an eye, and the whole world blind. 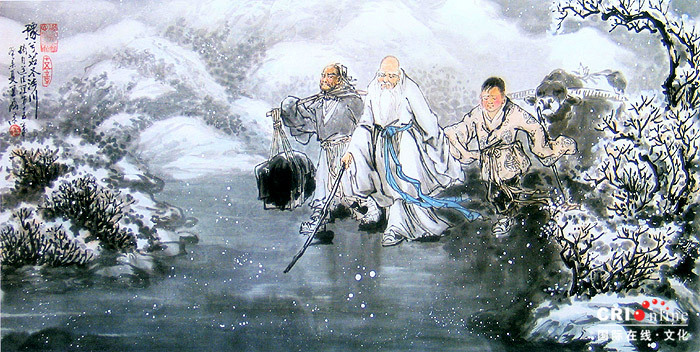 Laozi, like other great teachers in the world, suggest forgiveness. Forgive, and hatred stops. Forgive, and there is no need to getting even to each others. In mutual understanding and forgiveness, others are spared, our self is spared, and the whole world lighter. -> In sentiments, courage could lead to hurting and killing. In stillness, courage to refrain from participating saves. E.g. when someone hits you, courage could be used to revenge (kill), or forgive (saves). -> When and what to act, or not act? When to be submissive, and when to stand up? Appropriate reaction will be depend on who you ask and in what context. E.g. should you always be submissive, or always stand up? Even saints in their selves have difficulties to tell. -> Despite of its can’t readily be seen/heard/touch/perceived, it is everywhere and therefore have the necessary knowing to judge what’s good for all. 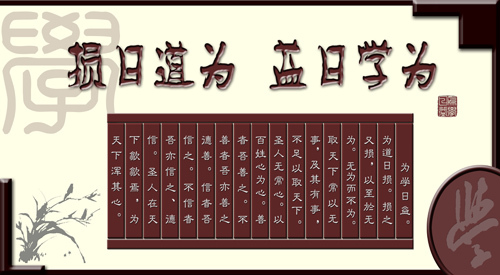 In Chinese tradition, we believe everyone ultimately will be accountable to whatever one does. As the heaven is a giant net that covers all without exception. No running away is possible, it is just a matter of time and condition when what we does comes back to us. When one does good deed, one build up one’s karmic merit which attracts blessings in one’s life and vice versa. Heaven is the universal mechanism that administer this law of attraction to us as human. While criminals could get away from the human criminal justice system, there is no getting away from the universal/divine justice system. Therefore, all great masters and teachers suggested positive deeds, this is for our own benefit. -> The limited self, with its limited perception and bias, is not capable to see the whole picture in this unlimited universe. Having some understanding and opinions and proceed to claim that one knows, is arrogance out of ignorance. -> On the other hand, when one become honest and admit one’s limitation and bias, i.e. the self is limited and cannot know the universal wisdom, one is integrous and return to sanity. I.e. a limited but sane person. -> By admitting our limitations, we become true to what we are, and therefore do not fall into the temptation of self inflation and ignorance. Saints are no difference, they do not claim their “self”s to be perfect and all knowing, but attribute that divine perfection to the universe and the Dao. If claiming to know is sick, then are we all sick? Yes, if we are unaware; and we become sane again when we become aware of it. If our knowing is temporary and limited, how then should we view the knowing of the self then? Should we stop trying to understand and know all together and claim that all knowledge and knowing are limited? No, because if we do that we fall into another extreme of concluding all understanding as temporary. Laozi said that, knowing the limitation of the self is adequate. With this intuitive understanding, one can continue life with the self, in the natural rhythm of the universe, yet not fall into the sickness of self-inflation and ignorance. Sanity returns. -> do you know? are you doing without doing? -> seemingly random speeches have their meanings; seemingly random actions have their purposes. Do you understand Laozi? -> When you understand, are you putting your understanding in action, like Laozi did? -> Why? Because saints (Daoist enlightened being) can look like a normal person living a normal life, while living with wisdom and everlasting peace. Who say saints can only be found in temple or in the mountain? What is principle? What is basis? It is the universal flow devoid of yet inclusive of the self. Paradox? Yes, it is, to the self. How to overcome? Go beyond your self by fully embracing and mastering it! When we progress, the self become quieter and quieter, and one begins to identify with the non-personal greater field of consciousness and awareness, which is underneath the self and is not subject to the limitation of separated and personal self. When this is realized, life becomes easy to know, and to do. -> When we think of big, we think of some thing describable and definable. -> When it looks like something, it is limited to the description of the something, and therefore is not the ultimate big. -> When we stand up for kindness, it is bravery aligned with truth; when we stand up for recklessness, it is bravery without purpose or direction. When we can save, we can spend. When we know humility, we can lead without getting lost. -> reckless bravery, unsustainable spending, arrogant leadership. What else except destruction can they lead to? -> Align with kindness and one life will be protected by it. The Dalai Lama’s religion is kindness. And so did Laozi taught. An important quality towards mastering oneself and the world, one need to cultivate kindness. Be kind to our self, be kind to our loved one, be kind to our enemies, and to our fellow members of the world. Be kind to our essence-energy-spirit, be kind to our body-mind-spirit. Jesus taught love, Buddha taught compassion, Confucius taught benevolence, and Laozi taught us kindness. Learn economy as a practical way to life and cultivation. Learn how to save so that we have something to spend. Manage our money, manage our energy, and manage our life. Lastly learn humility so we can live our lives embracing our limits, lead at the front yet supporting everyone from behind. These are what Laozi suggested. Bees and snakes won’t bite, fierce animals won’t claw, and large birds won’t hunt. -> when the body and mind are purified into peace and non-self, negativity are melt into divine love and peace. (Their) bones and ligaments are soft but when they hold their fists are tight. -> When the spirit (what underneath-beyond the mind) is at peace, mind is clear and body is healthy. -> watch baby cry, they cry with their whole body, not over push nor suppress. When they get tired, they rest and go to sleep. -> Do we value harmony? The Chinese does. Harmony in our body, in our self, with others, in the world. When we value harmony and see it as normal, we are wise. -> note the word “excess”, Laozi does negate desire as a human condition, just not indulge in them. When we indulge in them, we are enslaved and not free. -> cycle of life, inevitability of change.. When we try to hold on to something temporary, we are not flowing with the Dao and bringing to ourselves sufferings. 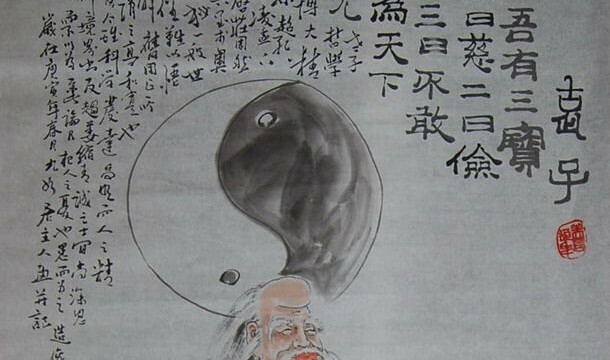 This Chapter Laozi describes the tangible benefits of living in the Dao: One’s body is healthy, energy is abundant, in harmony in oneself and with the world, and is filled with and protected by love and peace. Why? Because harmony is what all originally is, is normal. We just failed to see it when we are entangled in our self and its various desires. When we let go of our attachments (including aversions) of and to our self, we become more free, and more able to see harmony in the world. -> There is also the mother of our self. -> Consciousness can exist without the perception of the body, the body cannot be aware of itself without consciousness. Therefore, consciousness is the mother, body is the son. By knowing this relationship between consciousness and body, and realizing the consciousness within, one lasts despite of physical change. -> holes and doors of the self. When there are holes not filled, there is place for self to come in; when there are doors opened, there are places one’s attention could leak. -> When we attached to and endulged with our self, we are entangled with the temporary and is troubled. On the other hand, when attachments are surrendered and transcended, there will be no one let alone trouble to be saved. To be able to see the self’s limitation is wise, to be able to abide in softness is strong. -> Greatness arises from humility, strength arises from knowing one’s weakness, strength manifested out from understanding the duality of hard and softness. -> Directly one’s attention from perception to one’s innate reality, there is life beyond physical death. Laozi use the term mother and son to describe the relationship between consciousness and the physical body. By surrendering our attachments and aversions, we are shutting doors and filling holes to our self, and the temporary perception of the world. By accepting, surrendering and transcending our self, we realize our innate reality of the motherly consciousness, and therefore is beyond the trouble and suffering of the world. -> vs. we like to interfere and manipulate our creations with our agendas, bias, and attachments. -> Dao and De everlastingly give birth and nuture all things. Together represents and ongoing creation and evolution of all. -> As the ongoing source and totality of all, the Dao does not own or manipulate anything. Even life and death are seen as life in different forms (e.g. plants in different seasons). No dying or killing is therefore possible, such is Daoist look of the world. We like owning things, claiming credits and manipulating things. When we do so, the self is engaged, and we align with the temporary and limited. The Dao does not own things, does not claim credit, and do not manipulate things. When we follow it, the self is transcended, and we align with the everlasting and unlimited. -> When we study in school, at home, in society, typically we acquire and accumulate information. When we cultivate the Dao, on the other hand, we surrender our attachments and aversions. -> In the beginning, the strong attachments of the someone is surrendered, e.g. attachment to feelings is surrendered, aversion to physical discomfort is surrendered, etc. At a later stage, attachment to the “someone” and “someone doing” are surrendered, doing happening on its own without the notion of anyone claiming authorship and ownership. This is non-doing. -> Not-doing: no “one” doing. not not-doing: no “one” not doing. Ordinary people just do and not-do; Advanced students align to not doing, masters neither do nor not-do. -> Be in the world in non-doingness. In such state, all is perfect. When attention is drawn back to the self and its perception, the notion of something to do arises, one becomes limited and not sufficient to rule the world (discordant from the universal rhythm of the Dao). This chapter outlines a key attitude in cultivation – surrenders. In conventional study, one usually thinks of learning something, acquiring something, understanding something, and realizating something, and realizing something. At a more advance stage, all of the above continues, yet no separate self drives or claims to drive the process. All becomes part of the flow, with one merely agree to and allow the process to unfold. Such is surrender. -> What is softest? Not water, not jelly, not cotton. Non-form is. -> Form, confined to a specific description, definition, space, and category, is limited. When life identifies beyond form, one is therefore unlimited. -> When someone does, there is the limitation of the “someone”, including its strength and weakness, preference and resistance, etc. When doing is allowed without the attachment to a particular “one”, no one is doing and paradoxically, everything is done perfectly. Look at involuntary functions of our body, it goes on without any direction from “self”, but functions perfectly. -> How many of us have arrived at the state of non-self, non-doing, and non-one? We are so used to the notion of a independent, everlasting “i”, including its doing, feeling, thinking, being, etc. Laozi describes the possibility of life beyond this self created and sustained self. Like the involuntary part of our body, our life could continue perfectly without the constant claiming creditt by our “self”, but actually despite of it.